Although the story has appeared in a number of news outlets overnight, the actual BMJ article (and corresponding editorial) upon which they are based have not gone live yet. Until that happens, we’ll have to content ourselves with one of the preliminary reports. The gist of the story is that last February a man with recent poultry exposure was hospitalized in a general ward in a Zhejiang hospital for 5 days before being identified as having H7N9, and during that time another patient in the same ward contracted the virus. Both men died, and genetic testing showed their viruses to be almost identical. First a link and some excerpts from the MedicalXpress, then I’ll be back with more. However, because no other common exposure was identified, they say "it seems most likely that the H7N9 virus was transmitted from the index case to the second case during their stay on the same ward." We’ve had pretty good evidence of household transmission of the H7N9 virus for several years (see 2014 WHO H7N9 FAQ & EID Journal: H7N9 In Two Travelers Returning From China - Canada, 2015), and given the fact that only the `sickest of the sick’ are ever tested for the virus, there’s a pretty good chance that a substantial number of mild cases go unnoticed. One study conducted after the first wave in the spring of 2013 – where just 134 cases were recorded – estimated the number of cases really ran into the thousands (see Lancet: Clinical Severity Of Human H7N9 Infection). Their estimate? Anywhere between 1500 and 27,000 symptomatic infections. Although no sustained transmission has been observed in the community (an observation reinforced by very few secondary infections in contacts of known cases), the H7N9 virus continues to evolve and change over time (see EID Journal: H7N9’s Evolution During China’s Third Wave – Guangdong Province). 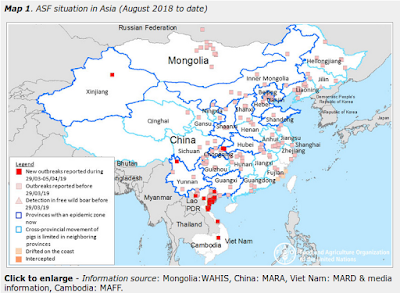 The H7N9 virus has, at last count (see Nature report), produced at least 48 genotypes, spread across three major clades, and it is likely that this constellation of H7N9 variants will continue to expand. While it may be entirely coincidental, the day-to-day reporting of H7N9 out of China went from relatively sparse to nearly nonexistent in early March of this year – a week after this second patient died - something I blogged about in H7N9: No News Is . . . . Curious on March 19th. Since then we’ve seen nothing but barebones reporting of cases, often just totals in EOM epidemiological reports, with little or no useful detail. A far cry from the sort of openness the Chinese displayed during the first two waves of the virus.